Avocado and... chocolate? 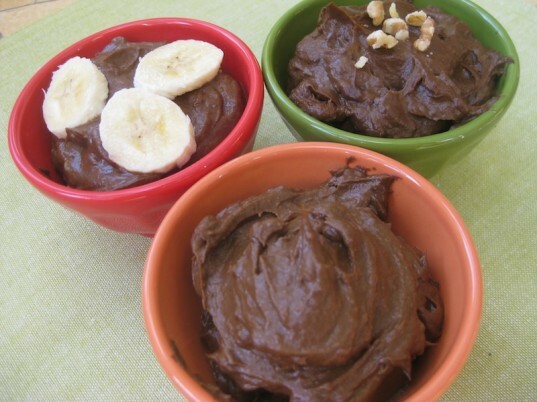 It may not be the most traditional food combo, but as we mentioned in our post on power breakfasts, chocolate avocado pudding, often dubbed "chocomole," is an easy recipe that raw foodies love for a quick and nourishing snack, breakfast, or treat! Try this recipe out on your family and see if they can guess what makes it different from your typical chocolate pudding. We love chocomole because the ingredients are simple, it takes less than 5 minutes to make, and the avocados add healthy, filling fats as well as doses of Vitamin K, folate, and potassium. This recipe is also perfect for modifying. We have included variations, such as using carob instead of cocoa and swapping out one of the avocados for a banana. Whatever way you make it, serve this pudding to kids and adults alike and know you're contributing to their healthy diets! Read on for a healthy, filling treat that turns a green fruit (that most people actually think is a vegetable) into a pudding! This is definitely not a task for little ones. I think the easiest way to cut an avocado is to puncture the skin and make a line through the skin all the way around the length of the avocado. When the line connects, you should be able to twist the two halves apart. Using a sharp knife, cut into the pit. 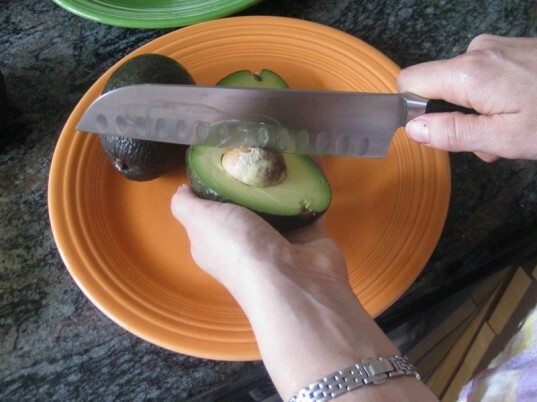 Turn the knife and the pit should come out in a ripe avocado. You can also use a spoon to scoop out the pit, but you will likely lose some avocado flesh along the way. Regardless, be careful! Place the avocados in the bowl of a food processor and blend until creamy. 4. Add the other ingredients, process and serve. Add the dates or agave, cocoa, and vanilla and blend. If the dates are not super soft, they can take a bit to break up. You may have to stop and use a spatula to push them and the rest of the mixture down several times in order to get the dates well incorporated. The agave nectar blends in much more easily, but dates offer a naturally sweet option. Before chopping, you can always place the dates in warm water to soak and soften for about 1/2 hour before chopping and blending. Serve. This pudding is very rich so you can get away with giving smaller portions. Top with fresh fruit or nuts. Place all ingredients in the food processor and blend until creamy. Adjust sweetness as necessary. Gather the ingredients. Cut the avocados. This is definitely not a task for little ones. I think the easiest way to cut an avocado is to puncture the skin and make a line through the skin all the way around the length of the avocado. When the line connects, you should be able to twist the two halves apart. Using a sharp knife, cut into the pit. 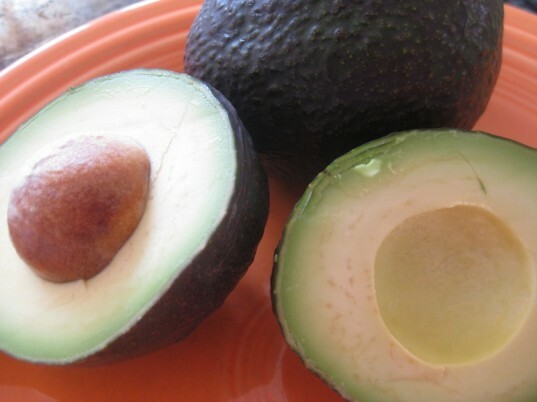 Turn the knife and the pit should come out in a ripe avocado. You can also use a spoon to scoop out the pit, but you will likely lose some avocado flesh along the way. Regardless, be careful! Place the avocados in the bowl of a food processor and blend until creamy. Add the dates or agave, cocoa, and vanilla and blend. If the dates are not super soft, they can take a bit to break up. You may have to stop and use a spatula to push them and the rest of the mixture down several times in order to get the dates well incorporated. The agave nectar blends in much more easily, but dates offer a naturally sweet option. Before chopping, you can always place the dates in warm water to soak and soften for about 1/2 hour before chopping and blending. Serve. This pudding is very rich so you can get away with giving smaller portions. Top with fresh fruit or nuts. I would think a dash of sea salt would help set the chocolate. The first variation is to simply swap out the cacao powder and use carob powder instead. Carob powder doesn't contain any caffeine and has a bit of a caramel flavor. Delicious! 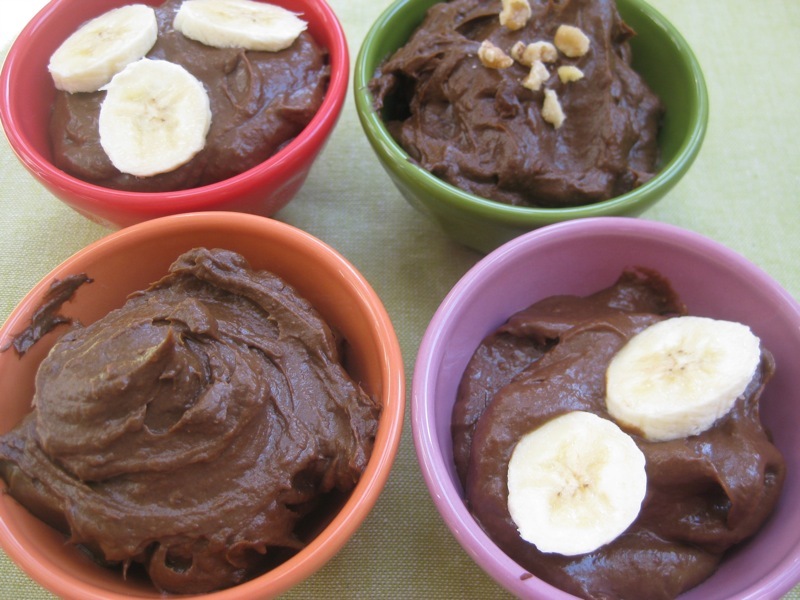 And here's another option that uses bananas: 1 avocado 1 banana 1 1/2 Tbsp agave 3-4 Tbsp cacao powder 1 tsp vanilla (optional) Place all ingredients in the food processor and blend until creamy. Adjust sweetness as necessary. 2 avocados ¼ cup cacao powder 1 tsp vanilla 8-10 chopped dates, softened if dried or 2-3 tbsp agave nectar Gather the ingredients. Cut the avocados. This is definitely not a task for little ones. I think the easiest way to cut an avocado is to puncture the skin and make a line through the skin all the way around the length of the avocado. When the line connects, you should be able to twist the two halves apart. Using a sharp knife, cut into the pit. Turn the knife and the pit should come out in a ripe avocado. You can also use a spoon to scoop out the pit, but you will likely lose some avocado flesh along the way. Regardless, be careful! 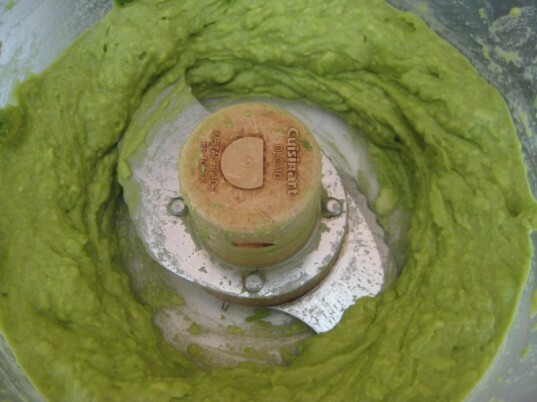 Place the avocados in the bowl of a food processor and blend until creamy. Add the dates or agave, cocoa, and vanilla and blend. If the dates are not super soft, they can take a bit to break up. You may have to stop and use a spatula to push them and the rest of the mixture down several times in order to get the dates well incorporated. The agave nectar blends in much more easily, but dates offer a naturally sweet option. Before chopping, you can always place the dates in warm water to soak and soften for about 1/2 hour before chopping and blending. Serve. This pudding is very rich so you can get away with giving smaller portions. Top with fresh fruit or nuts. The first variation is to simply swap out the cacao powder and use carob powder instead. 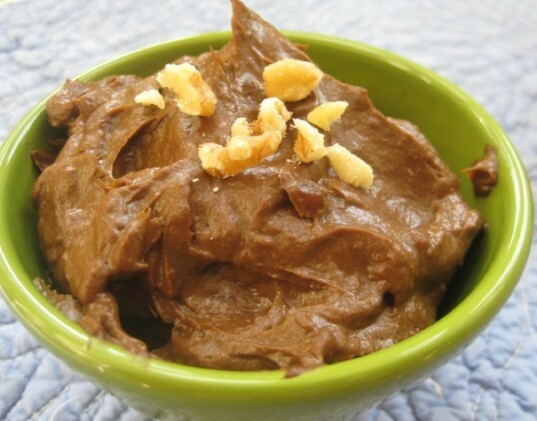 Carob powder doesn't contain any caffeine and has a bit of a caramel flavor. Delicious! 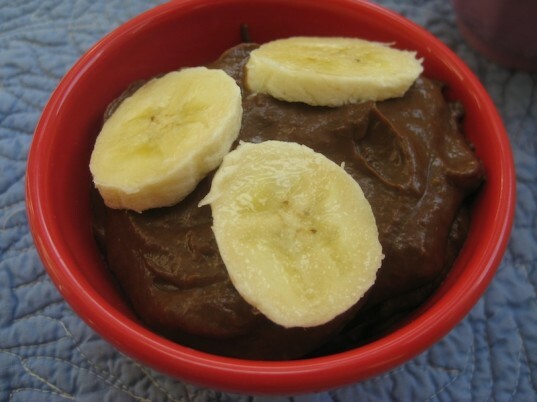 And here's another option that uses bananas: 1 avocado 1 banana 1 1/2 Tbsp agave 3-4 Tbsp cacao powder 1 tsp vanilla (optional) Place all ingredients in the food processor and blend until creamy. Adjust sweetness as necessary.